When Danny and I spent our honeymoon in Italy (man, was that really 7 years ago? ), I was happily shocked to find that nearly every farmacia in Umbria stocked gluten-free pastas, breads, and chocolate croissants. I never expected to eat gluten-free chocolate croissants on a honeymoon in Italy. And they were good. All those products were made by Schär, our latest sponsor. Seven years ago, when we returned home, I had a hard time finding Schär products here in the United States. There were far fewer gluten-free products on the market then. I’m happy to say that not only is the entire line of Schär gluten-free foods available in the US now, but also those foods have improved since then. These par-baked baguettes (ready for you to finish baking them in your own home oven) are just right for that hot garlic bread you want to make, the one with the shattery crisp crust. Most exciting, to me, is the fact that the new Schär breads do not contain xanthan and guar gum. Instead, they use psyllium husk powder, which is what we have found to make the best gluten-free breads. We’re testing bread recipes so often that we don’t buy packaged bread often. But we have a bag of these multi-grain ciabatta rolls in the freezer now, always, so we can make a quick sandwich for Lu’s lunch if we’re between loaves at home. 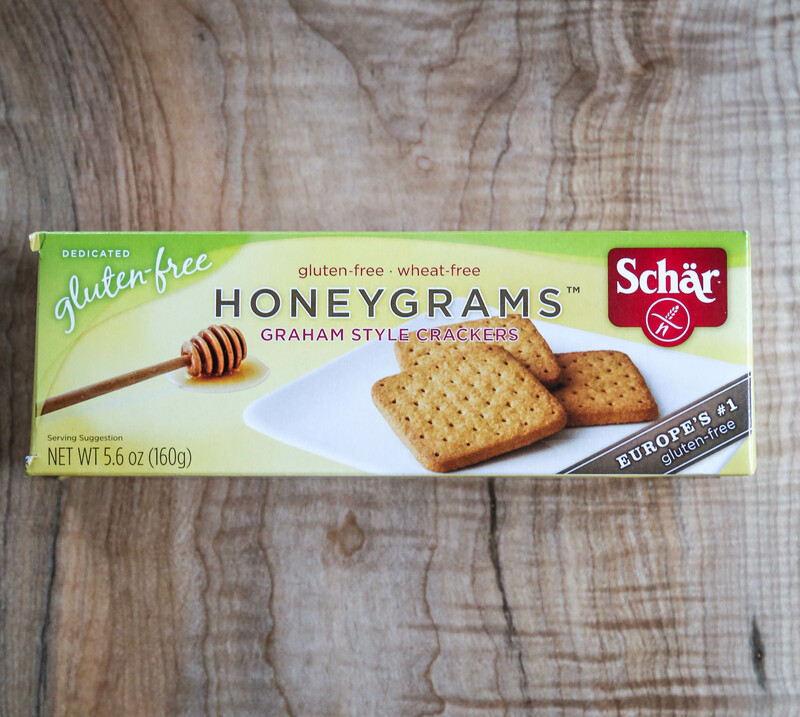 The big hit in our house right now is these Honeygrams, which are delicious gluten-free graham crackers. Lucy is particularly happy about these, since they make it possible to have s’mores in the house. (We have taken her camping a couple of times, and she wants to camp all the time now. Even in the house. Mostly for the s’mores.) They’re mildly sweet and hold together well when dunked in milk. Lu asked for one in her lunch every day until they disappeared. We have more on order right now. Schär makes some of the best gluten-free packaged food I have ever tasted. (And Danny and I have tasted a lot of gluten-free packaged food in the past seven years.) Their breads, crackers, crisp breads, cookies, and graham crackers are really a tremendous boon for those of us who have to avoid gluten. We recommend them to you wholeheartedly. That’s why we’re thrilled to have Schar as our latest sponsor. Schär would like to give a big basket of their cookies — chocolate hazelnut bars, lemon wafers, ladyfingers, cocoa-dipped wafers, shortbread cookies, honey grams, and more! — to one lucky reader here. Just leave a comment letting us know why you would like to try these products. I’ve tried their pasta, but none of the other products. I would love to try the honey grahams…it has been way too long since I have had a graham cracker! My son has a friend who doesn’t have celiac disease but needs to eat gluten free. So when he came to stay for a night from school I panicked a little. I went out to the market and got some gluten free, pretzels, crackers and sweet potato chips. (the boys said just to get snacks) I also purchased gluten free pancake mix which I got a recipe for online. Not knowing how this would come out I went out on a wing and a prayer. The blueberry pancakes were better than any I have ever had. I didn’t feel like the pancake was sitting in my stomach all morning. I am now venturing to gluten free even though there is no medical reason for our family to. Would love to sample these gluten free products. I love their products! I even had a friend ship some from Germany, since I can’t find their tea/digestive biscuits here. Those smores sound pretty good! I have had their pasta and rolls but I would love love to try the cookies!! 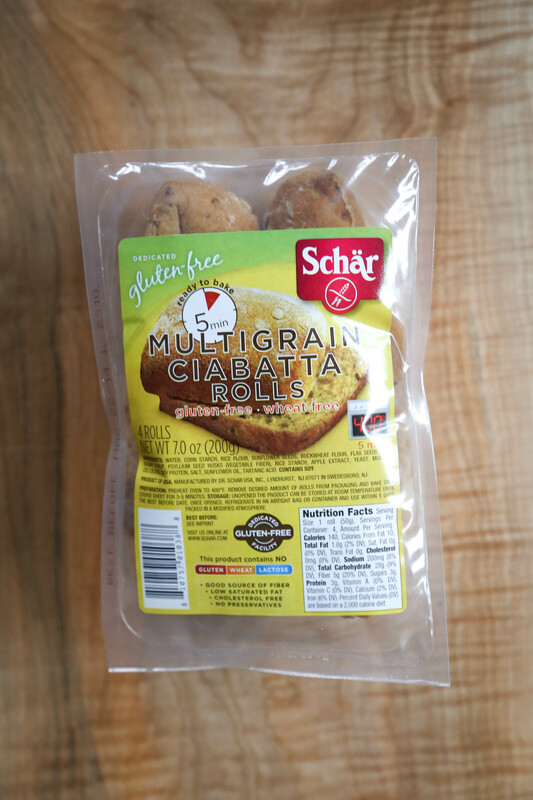 I have only tried a few prepackaged gluten free breads, and I would love to give Schar a try! They look convenient and tasty! Schar products are just beginning to show up at our local Safeway. I would love to sample these products so I can request that they carry the ones I like. …I miss s’mores. So. Much. And shortbread. Oh, shortbread! I’d love to try them all. I have just become gluten free in the last two month. I don’t even know where to begin on telling you how wonderful I feel! The hardest thing right now is find fabulous gluten free products. I have yet to try this brand and would love the chance too! I enjoy the Schar products so glad they have made a nice showing now in the US! Would love to try some graham crackers! I have not had the pleasure of trying Schar products. I spent the summer in Italy and wish I’d known about this before so I could have sought out their gluten free products. I will make a special effort to search for their products in my local stores. I have recently discovered I have a gluten sensitivity so I look forward to trying Schar products. I love the limited amount of Schar products I’ve been able to access locally. Getting to try (and share!) this variety would be a great treat for my new office. I’m especially in love with their hazelnut wafers!!! Yum! Me me me I’d like to win! I’d love to try these and tell my readers about them. My sister and I both have celiac. They have some of the best products we’ve tried! I’ve only been able to find limited varieties of Schar products. Had no idea they have so many offerings! Would love to try a basket of goodies! I am new to being Gluten Free (found out I have Celiac about 2 months ago), and I’m still looking for yummy bread and cookies. I would LOVE to be able to try some of Schar’s products. I’ve seen a few products in the stores near my house, but very few. I have only tried their chocolate chip cookies, which are absolutely delicious! I’d love to try their other products too. I tried a schar bread roll on vacation and it was the BEST gluten free bread I had ever had. I would LOVE to try thier other varieties! Have tried several varieties of this brand. My whole family just went GF about 2 months ago. Always looking for new yummy treats to try out! I am brand-new, just diagnosed with celiac disease. Getting my bearings and determined that I will be in control of managing this. I have a support group of 2 good friends who are also celiac, and we would LOVE to enjoy this basket of goodies! Thank you! I enjoy many of their products but had to give some of the best ones up when I became soy protein intolerant. I haven’t tried all their products either as only select ones are available locally. Would love to try more! Fingers crossed the Graham’s are soy free! For the past year, I’ve slowly been introducing gluten-free recipes into my diet – not because I’m gluten intolerant, but because I’m excited about moving away from exclusively using industrialized wheat products in my home baking. I believe in supporting the move to reintroduce healthy and global grains into our diets. 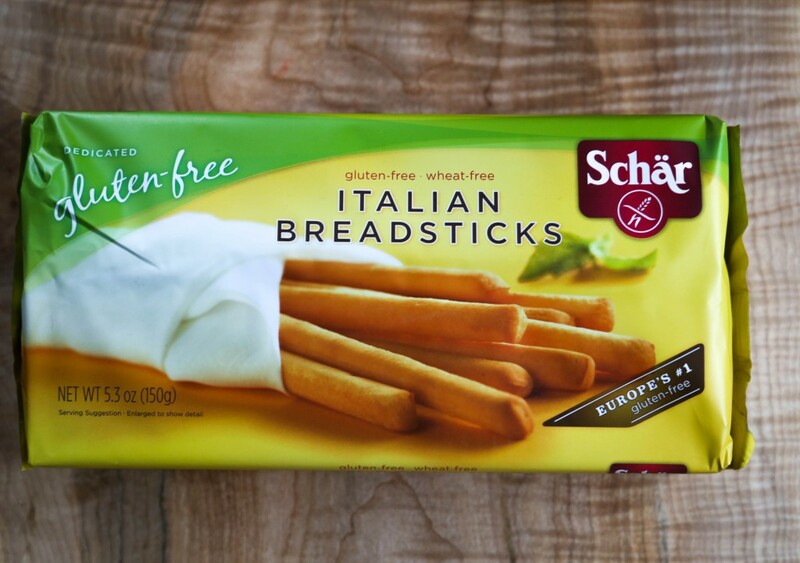 I also love finding new gluten-free products, so I would love the opportunity to try Schar’s products! I love their graham crackers, too! I would love to win a basket of cookies! I am so excited to try these Schar goodies! My husband and three of our five children are gluten intolerant, so the graham cracker option looks particularly great. Also, you can’t beat a good baguette! We would love to try those Schar baguettes. Congratulations on your new sponsor! Graham crackers! Oh be still my gluten intolerant heart!! The frozen bread idea is brilliant as well, making it just right (and not stale) when you want/need it. Would be delerious to get a basket of goodies! Schar’s was my savior when I first had to go gluten free. Pasta, cookies, bread and my all time favorite the crackers. Use them in all my crab and salmon cakes. My Italian husband recently had to make the switch to gluten free. We would love to try the breadsticks and rolls as that is what we miss the most right now. I love their chocolate hazelnut bars. Yum! I found this brand in a trip to Pennsylvania and was so happy to be able to order them online. Wow! Graham crackers, I need to find these somewhere. I would like to try these — as I’ve learned more about g.f. flours we’ve come to prefer them. Multi-grain and lightly sweet are also a plus in our household. Love these products! The local retailer that sold many of the specialty varieties in my area went out of business so I’ll keep my fingers crossed for a basket! I love Schar products! I’ve tried there crackers, cookies, and pasta. They are the best for gluten free products! I would love to try their products. I’ve gone paleo and while I’m currently pregnant, I do occasionally want bread. This would be a great opportunity to try their products. Coincidentally, my husband and I have planned a vacation to Italy in April. I love your sourdough bread. Would like to try the rest of the line. Oh how wonderful it would be to have s’mores again! My 10 year old daughter would jump up and down with excitement. She normally watches as her siblings partake me she has some sort of variation. I would join her in that goodness for the first time in a long while! Off to check out the website! I have given up eating bread since I was diagnosed with celiac. Would love to find GOOD bread/products that are suitable for celiacs and Schar products sound like they would be perfect. Love Dr. Scharr! Would love to try those cookies! Yum! I too fell in love with Schar products in Italy. One of my favorite memories of that trip was sitting in a piazza, drinking a cappuccino and eating Schar cookies. I never imagined I would be able to find them in the US! Gluten free cookies! Yum! The wafer cookies are light, crispy. I’d love to try the other products! I’d love to try these! I bet they would be good with tea, my favorite beverage. I bought my first product from them about a month ago – a package of 4 dinner rolls, but have yet to try them. They were bought *just in case* I didn’t have time make rolls from scratch, which somehow I managed to do. What appealed to me was the lack of cane sugar used (in these at least) as a little one I often cook for has sensitivities to that as well as gluten. I would love to try Schar breads and goodies. I so miss graham crackers…I’d love to win. Thanks for the review, I’ve been eyeing them at the store but wasn’t sure if I should try them. Your seal of approval is all I needed! I’d love to try these, for reasons that are similar to what you’ve stated here – I want to eat real food, without gums and fillers. These seem to fit the bill! My wife is gluten-intolerant and I try to support her by eating gluten-free with her and would love to try the wonderful looking products. Om my goodness, I am THRILLED to bits to read about these products – I’ve not heard of them before! Both my husband [he is celiac] & I are gluten free and we are constantly on the lookout for new/different products to add to our diet. Cooking from scratch is so time consuming but often the safest bet, so boy, is it exciting to discover some readymade alternatives. I can’t wait to try ALL of these! Although I enjoy being inventive in the kitchen, it’s nice to have a few gf packaged things around for the family. Would love to try this brand. This is the best GF lifestyle website! It makes me feel more adventurous and full of life! I’d love to win this prize to try out these awesome products! I miss graham crackers so much! I’ve seen this brand at random stores but now I will for sure be trying their brand. Yummy garlic cheese bread sounds really good, I have not had that in years! My eleven-year-old daughter is handling her new celiac disease diagnosis with a great attitude and a depth of maturity I rarely see in other kids her age. It’s wonderful to be able to trust a company like Schar for the occasional treat when she needs it! Thank you Schar! The breads and crackers are so yummy her brother can’t even tell they are GF. I have just been diagnosed celiac after months of doctors telling me they had no idea why I was feeling such bad stomach pain so I am still discovering the how to’s of the gluten free world. It is so hard to know which brands are the best and I would love to try something that you recommend so highly! Sounds like I’m missing out–I haven’t tried many Schar products at all. I think I need to find out what all the excitement is about! Oh my! Those ciabatta rolls look delightful, I would love to try them. And shortbread cookies as well! Really excited to try these — thanks so much for calling our attention to Schar! Would love to try a new product and the kids are pretty excited about s’mores! I am pleased and relieved to discover that there are products like that of Schar that are gluten free. I trust they will serve as a model to the USA manufacturers that gluten free can actually be delicious. The US ‘gluten free’ products I have tried thus far are horrible tasting and horrifyingly expensive. I would live to try these! I don’t eat any grains most of the time but every once and a while a really good baguette would be divine. And really, croissants? Really? When I spent my first summer in Spain 3 years ago my friend’s family would go to the local health food store in their tiny town in the Pyrenees north of Barcelona to get me Schaar pasta, cookies, and bread. They introduced me to the Catalan breakfast of pan con tomate (bread with tomato) with that Schaar bread. And there was a sleeve of cookies that we took with us on our weekend roadtrips and camping trips that I was never able to find in the U.S. upon my return. Schaar products were an amazing find for the beginnings of my gluten free days, and I would love to try some of their newer products. The first thing that I thought of was Campfire S’mores… YUM!!! It would be like Christmas for my daughter to have a basket full of goodies to sample! That may sound silly, but it’s true. And to be able to sample things before we buy them is a great bonus. We love the few sweet treats we’ve tried so far! I’d love to try the bteafds as well! I love their chocolate hazelnut bars, and would love to try some of their other products! I have been searching for yummy gluten-free treats and breads for my son and I so that we can make some food prep easier for our allergies and sensitivities. I have never tried this brand but would love to! I plan on ordering a few items! So glad you posted this!! I am new to GF products and have found few that are really tasty, these sure sound delicious! Excited about your blog! Love this brand, the gram crackers look great….look out s’mores!! *Such* a fan of the Schär spaghetti, excited to have been able to track it down in the Seattle area after enjoying it in a restaurant last summer. I find both the taste & the texture to be pretty much indistinguishable from the non-GF variety! Eager to try more of their products!!! Does it sound like my name?, then that is why I want to try them. Schar is one of the first websites I stumbled on when doing searches for gluten free items. They made a Panettone, and made me feel so awesome about possibly being about to eat wonderful things again. I have a really hard time finding gluten-free foods that don’t taste like cardboard. I was told by my doctor I need to cut gluten but just can’t do it when I would miss bread so much. Would love to try something that tastes great to help get me motivated. I’ll love to try these products! The bread looks soooo yum right now. I tried their hamburger buns when I stumbled across them in the store last year. They were so good I was in shock! I would love to try their other things, as well! I would like to try these because – Yummers! Things I haven’t had in over 4 years. I want the graham crackers now! One of my sons and I have to eat gluten free. I would love to try the Schar graham crackers! We live in a small Kansas town-our grocery store doesn’t have many gluten free choices. Thanks! I had no idea schar had such a huge line! I discovered Schar products when I lived in Brazil. I was quickly hooked. Now I’ve also discovered Honeygrams, which are definitely the best graham-type crackers out there! I have seen these products at my local Sprouts Natural food store but haven’t tried them. I am corn and gluten intolerant…..life with food can be a bit challenging….this basket would be great! I love their rolls, but haven’t tried their cookies…I would especially love to try their grahams!!! I’m glad to hear that their products no longer use gums. I’ve had terrible reactions to xatham and guar gum and so there are very few bakery products available unless I make them myself. Chocolate Hazelnut bars are oh so good. I have bought Schar products before and have been very happy with my purchases. Would love to try their new cookies. S’mores……yummmmm. These all look delicious, and I’ve not seen many of them in my store. I would love to try these. I love these products. Our local store sells the bread and they are delish. The baguettes make the best subs – turkey, avocado, tomato, mayo. Love it! Their products have the best taste and texture. Quality. Love Schar and their commitment to gluten-free foods. I want to be able to stock some delicious gluten free items to serve to GF friends who visit, items that taste appealing in addition to being safe to eat. I’ll vouch for their gluten-free saltines. I bought some the last time I was in Barcelona (haven’t seen them here in the US, yet) and was so happy to be able to crush them in my soup just like the “old days” . They do make travelling in Europe easier, as I can pop crackers, muffins, etc., in my purse and have a bakery-like product for breakfast no matter where I am. Might you be referring to the table crackers? If so, they are available at Sprouts (if you have one locally) or I am sure online. To me, they are just like a saltine (but with a little less salt) and have two crackers attached. They are my favorite gluten free cracker. I tried the Schar bread for the first time this year in Rome. Ahhhhh! it made me so HAPPY! And after you just posted that their new line uses psyillium husk instead of gums, I am nearly beside myself with joy!! FINALLY!! More! I want to try more! I love Schar products. I always have a stash of their ciabatta, classic dinner rolls and multi-grain ciabatta in my freezer. The honey grahams are sitting on my pantry shelf just waiting for the next Key lime pies or cheesecake crust. When we want to have a wine & cheese dinner, out comes the Schar baquette. These products are the best. I live on a farm on a remote area of Montana. Gluten intolerant and two hours away from the nearest city for gluten free products. I would love to receive this Schar gift basket and introduce these breads and crackers to the Billing health committed grocery stores. I am so excited to try these products – diagnosed with celiac disease just 3 months ago this would be so fun to try! I will be scouting out these products for sure! I have never heard of Schar products and have recently gone gluten-free. I am extremely curious to know where I could find these products in Seattle and would be delighted to win the sample basket to try them out immediately. It is good to know that I might be able to supplement my pantry with delicious and convenient products and not have to make EVERYTHING from scratch. I would love to try something new. If you are endorsing them they must be good! I would love to try Schar products. My three year old has been gluten free for the past 4 months. The stuff he misses the most are the crackers and breads. We haven’t found any prepackaged ones that we have really enjoyed yet. So, it would be wonderful to win! Thanks! I have come across some of their products in Poland, so am happy to see more of them coming to the US! That baguette….. I haven’t seen this brand around here. I would love to try some. You had me at hazelnut. Besides, their name is similar to mine! I’m new to Gluten-free and truthfully this is mostly research at this time. We have been going through a transition period with my 3.5 year old son that has included drastic changes in his behavior at home. I am seriously considering a gluten-free lifestyle and drastic reduction in sugar consumption and processed foods for our family in a hope that it may help him. I would love to try some more convenient gluten free items; some days I just don’t have the time to make everything myself! I LOVE Schar products. When we travelled through Austria, Switzerland and Germany (with braces) they saved my sanity. Since we’ve been home we’ve found one very large grocery store (not chain) that carries a few Schar products, and we buy them often. Part of the reason we’ve stuck to Schar is because they don’t use xanthan gum since it upsets our stomachs consistently. I am so excited they make a graham cracker – cheesecake crust here I come! I’ve only seen a couple of their products in our local stores, but I’d love to try more of them! I love the idea of making everything homemade, but sometime you just need some gluten free convenience food! Those graham crackers look scrumptious! I’d love to try them! I would love to try all of these products!!! A yummy graham cracker sounds amazing! It’s been so long…. Wait…chocolate croissants?!? A basket of cookies? I’m in! I love to bake and cook, but I’m a bit shy about trying to make croissants. I have to say it’s one of the treats I’ve missed most. I’ll be hunting these down. If you’ve endorsed it, I know it’s good. Thanks! Oh to have a baguette I could just pull out of the freezer…. Drool. And to again make a graham cracker crust? Excited. Would love to try these. I am about to return to gluten-free eating and would love to try these products! I’ve tried those baguettes but would love to try more– I’m always on the lookout for new yummy gf products! I would love to try gluten free bread. I have been gluten free for 2.5 years, but getting sick for at least 6 years. I just started getting Udi’s french bread from Winco’s which oddly even my mother who is not gluten free loves. Since it is still hard to get on a regular basis, I would love to try something that I might be able to get at Safeway. There are so many comments, but here goes…. Thank you for having a website where I can look up info and see suggestions. We have two little boys that are also camping fanatics! We have a family camp out every Friday night and roast marshmallows and they sleep on the living room floor in their sleeping bags. My youngest is the gluten intolerant one, but we’ve known since he was 6 months old so the good thing is he doesn’t have favorite gluten-filled treats he can no longer eat.. But it means our kids have never had graham crackers… Or s’mores… And can count on one hand the times they’ve been to a restaurant in the past 2 years. They are happy and healthy and eat well but I think as parents we are the ones that feel guilty when we have to turn down all the samples in Costco or that we find out our boys have no idea what a s’more is! It would be great to have safe graham crackers so they could learn about s’mores this summer. Or just to be able to have garlic bread with dinner… It would make things seem more normal. I guess I’ll have to watch out for Schar products! I’am looking forward to seeing more of Shar products on shelves as I have tried their cookies and pastas and find they are my favorite. And since I have to eat gluten free my husband is really good about eating gluten free with me. It would help us both have a chance to taste all their products. It is nice to have gluten free products out there that help out with the occasional issues of not having graham crackers for smores on camping trips, etc. And I was excited to see you endorsing another gluten free product as I love reading your blog and know that you are very health conscious. I am wondering, however, why you are endorsing a product that has modified corn starch in the ingredients. Please don’t think this is an attack at all…I live in California….we are trying to fight for labeling of genetically modified foods and to have farming that will not make us sick….just wondering what your thoughts are about GMO’s. I am always looking for gluten free products that are also NON-GMO. I guess the best products are those baked at home. Would love to hear your comments about gluten free products and the ingredients that are genetically modified. I was at a gluten free fair and talked to the Schar rep. I was questioning about the soy flour (I am soy intolerant as well as wheat). He told me that in Europe, where these products are made, they cannot use GMOs and therefore the soy flour is not genetically modified. I would like to assume the same could be said for the corn starch. You may want to contact the company directly for further clarification. My husband and I have reservations for a much needed get-away in a cabin that has a fire pit – would love to make some GF smores! Yum! I’d love to give this brand a try. I’ve never been lucky enough to try a single Schar product–I don’t recall seeing them in our local groceries. Sure would like to try them, though! I’d love to be able to share these with friends over a late afternoon cup of tea. I first discovered Schar products when visiting my daughter in Amsterdam several year ago. What a treat to have warm rolls from the oven, their European-style sandwich bread; several varieties of cookies I couldn’t find here; the breadsticks! I’m so glad their products are available here now. I was diagnosed with Celiac disease 5 years ago, one week after my 55th birthday. I walked out of the doctor’s office both jubilant and determined…jubilant because finally there was an answer to my years of sickenss and discomfort; determined never to intentionally eat any way but gluten free again. I hit an emotional low about a month after diagnosis, and found Schar table crackers. My life felt better with something that tasted “normal” and familiar. I would appreciate the opportunity to explore the Schar basket of goodies…but I will be glad for whomever is chosen for this privilege. I could not have survived without Shauna and Danny “teaching” me how to be gluten free deliciously. We are just starting to explore the gluten-free lifestyle after my husband voiced some serious digestive concerns. After just 2 weeks, he has seen dramatic positive results. We would love to try these products as my husband feels deprived! I have been consistently disappointed with GF bread options at the store, so much so that I’ve given up bread completely! (This is a very, very sad realization for me, needless to say.) I’ve also been missing a good graham cracker! I’ve read about the Schar products, but I haven’t had the opportunity to try them myself yet. Given your excellent review and recommendation, I am now dying to try them! I used to make some pretty mean sammies and garlic bread back in the day, it would be fun to try it again! And my husband would thank you too, for the opportunity to have those things back on the regular menu! Thank you and thanks to Schar for the opportunity! My son and I are on a gluten free diet to heal our inflammation, and I have not tried any packaged gluten free products yet. I try to make everything from scratch, but it would be nice to be able to have the option to eat a cookie or treat once in a while. I am especially intrigued by the parbaked baguettes, though, since I really miss a nice crusty loaf of bread. My son was diagnosed Celiac last August. He has embraced the diet because he feels so much better. People always comment on his great attitude about it. I would love to win the basket of fun new things to try, we are starting out on this journey and still have limited options. He eaters the same thing for lunch everyday, and I would love to find some other great options! We’ve never tried Shar products, but my son eats chocolate chip cookies from another company that makes gluten free products and would love for him to try their cookies and products. I’d love to try these products! I live on an island in alaska with very limited options for gluten sensitive folks like myself. Would love to try these products! I have tried some of them already and they were outstanding! Schar products are consistently good and better tasting than any other gluten free brand. Love their pasta and “rye” bread and am hoping to find more of their products in my area soon. Oh my! I’ve seen these products in the store at my local HEB, but have never tried them. After your glowing description, now I’ll have to. I must admit, the products look very bread-like in the packaging. I’m so happy to hear they’re not using Xantham gum now. Honey Grahams? I can’t wait. I’m so excited to try the ciabatta bread! I remember seeing a lot of Schar’s products when in Switzerland last summer and freaking out with pure excitement! I’ve yet to come across their honey grahams – haven’t has s’mores in ages. And does the brand really make gluten free chocolate croissants?? What a dream it would be trying that!!!! Schar is not currently selling products in Canada – soon, I hope. They sound fabulous – would love to try Lu’s favourite s’mores!! I’m going to throw my name in the hat for some Schar products. I’m just recently diagnosed celiac and have been GF for 1 week [best week of my life!]. I would love an opportunity to try different products that I can order more later if I like them! I’m breastfeeding and my baby seems to be having a reaction to wheat, so I’d love to try these to expand my options right now. 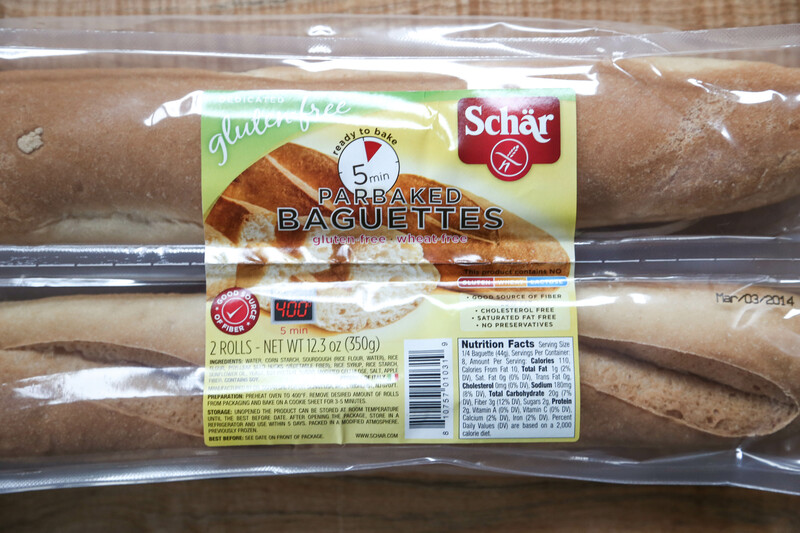 I recently received Schar’s Baguettes from a gluten-free monthly food service. You are right- they are amazing! I haven’t been able to find them locally yet, but I’m still looking. I would love to try more of their products! I’ve been a fan of Schar baguettes for some time now, but had no idea about all these other offerings! I would love to try them! Schär’s ciabatta rolls are fantastic! I really enjoyed them. Especially for an egg breakfast sandwich. But I am right there with Lucy: being able to have s’mores again would be amazing. I would love to expand my repertoire of great gluten free options! I love the multigrain ciabatta rolls, which a relative provided me at a barbecue, and I am so excited about the prospect of a decent gluten-free graham cracker. I’ve tried many different kinds for our s’mores parties, and given up unless i have time to make your recipe. I’ve been avoiding packaged gluten free items because of the weird added ingredients. So I’m always on the hunt for well thought out products. I’d love to try these! My daughter became GF about 6 months ago – she feels soooo much better now than she did before. As a mother, I am always watching for new products and new recipes to try. A basket from Schar would be wonderful. Does Schar really make chocolate croissants? I must find these. I do like the baguettes, but I’ll admit I was slightly disappointed when I grabbed a package for a road trip last summer without realizing I needed to finish baking them in the oven. Very dry when straight from the package! But still edible, as you know… being GF for 12 years makes you pretty tolerant of less-than-ideal. I was happy to find the bread pretty tasty when I finally was able to bake it properly in an oven:) Would love to try their other products! I have tried – and enjoyed – their table crackers. I am looking forward to trying some of the par-baked products! New to the whole GF experience and I’m flailing around looking to find my way. I’m sure it’s the same way for everyone first starting out. I will keep my eyes open for this brand. In our family of four , ranging from 25 to 57 each one of us has to loose weight due to medical complication. I would love to try out these gluten free products as a way to reduce gluten in our vegetarian diet. We have tried a few breads from stores but have been gravely disappointed. Your excellent review of the products make me want to try out the breads. Our whole family is celiac, and my husband and son would love to have so many treats to share. They both miss being like everyone else. The ladyfingers would make awesome tiramisu, I bet! Schar table crackers were the first gluten free cracker I tried that was worthy of being added to my soup, and for a southern gal who used to LOAD her soup with saltines, this was a big deal. I could finally enjoy soup the way I had as a kid! Now, 6 years later and 3 kids later we rarely splurge on packaged GF goodies, and that is why we would LOVE to win the cookie basket. We try to keep a box of cookies at our kids’ schools so that when someone has a birthday or there is a party with treats, my kids have a safe alternative. We would be thrilled to split this basket of goodies between home and school! I would, love, love, love to try these products! Please pick me! Ice cream sandwiches, quick graham crust for cheesecake or a snack on the run! Yum. I have tried a few of the products they offer, and would like to try some cookies that don’t have the gummy texture. I just found Schar graham crackers and love them! I would live to try their products. I want to win so I can try the gluten free s’mores! All the products sound delicious. I was diagnosed with a wheat allergy in December 2013 and am still learning to navigate the world of gluten free eating. Your blog has given me hope and inspiration that I can still enjoy good food that is safe for me to eat. I would love a chance to try these products – especially the honey grahams…. we are avid campers with our family in the summer and of course enjoying smores would be gf-icing on the proverbial cake! Thanks for being so generous with your experience, ideas, recipes and insights especially for us newbies! Always on the lookout for high quality, delicious GF food! Would love to try it!! Ok these look fantastic. Oh how my little gluten free kiddos will appreciate these new options. Can’t wait to try! My daughter and family who are gluten free, live in Europe and she has told me how delicious the Schar products are, but I haven’t found them in my stores yet. I would love to try the frozen parbaked baguettes….I can almost imagine the heavenly aroma as it comes out of the oven. I would love to try these since we are newer to this whole gluten free market. It is so overwhelming. Thanks for sharing. A S’more?! It’s been years. I’d love to try their products. Oh my…all of those treats sound absolutely delicious! It is always fun to try new gluten free options, and shortbread cookies?! Woo hoo! I was just diagnosed with celiac disease and have been off gluten for 6 weeks now. I feel amazing. Many of my friends have to be gluten free also. We are trying everything out there that’s labeled “gluten free” but have not yet tried the Schar products. So excited to see this product!! I’m new to the gluten-free world and looking to find good products. I’ve just begun removing gluten from my diet and have found that some gluten free products are just not tasty.You’ve recommended these so well, I’ll be on the lookout for them here in Canada. I have tried the Schar graham crackers, rolls, and pizza crust and have been very pleased. Great flavor and consistency !! The ladyfingers could reunite me with my all-time favorite dessert, tiramisu! Awesome – no xanthanum gum – so hard to find products without it ! Rock on Schar ! Schar makes absolutely wonderful GF products! I only wish the products were more readily available in the US. They are hard to find! Would love to win this basket for my son who has Celiac, and for myself – I’m gluten intolerant. Great news that they are removing the xantham & guar gum from their ingredients. I was thrilled when I saw baguettes! I could probably figure out how to make them eventually but for just me it’s not going to happen, but I really long for some garlic bread! There are other products they carry also that I would love to try. Graham crackers? Yes please! I would love to try these because my gluten-free boy is also my food lover. Especially sweets. We have a tough time finding packaged ones that taste good. We make most things from scratch at home, but once in a while it’s nice to have something packaged and ready to grab on the go. Ah, Schar!! I would love to try the honey grahams! We just returned from a camping trip where everyone, but my daughter and I, were enjoying s’mores! And the Ciabatta rolls, yes, please!! It would be wonderful to try the baguette and serve it with gluten free pasta! “We (my family and I) are new to gluten free… is being very hard to find “yummy” gluten free products, but we still trying and I don’t want to give up that soon…I found your blog by doing some research on gluten free and Im exited about reading such a good reviews to Schar products! can wait to try some myself! I would love to try these products. New since Dec 2013 to gluten free, have accepted the lifestyle change readily except….. it is so hard to give up a wonderful sourdough baguettes. I appreciate all that you bring to your writing to educate us. You made the transition transitionless for me. Because they sound so tasty — always on the hunt for GF stuff that tastes good! So happy when I discovered a schaar. Would love to try more of their products. i do like schar…but sadly i am having trouble with eggs..even more than wheat..so am always looking for recipes to cope with that, but admit i am still in the mourning feeling sorry for myself stage as i love baking and desserts and this puts a real crimp in many recipes. My daughter Em is 7 years old and just got her diagnosis of Celiac last month. We are learning fast and trying lots of new products. We will definitely look for Schar grahams! Em is doing great and has only had one food-meltdown. It was about Girl Scout cookies that she worked so hard to sell and then realized she would never taste another thin mint. The great news is that we found our local GF bakery makes their version and it’s better than the original. Thanks Bam Bam Bakery! Just finding out my husband is allegic to wheat was somewhat hard on me being a cook. We’ve tried other brands only to be disappointed on money thrown down the drain. It’s disheartening not bring able to make a sandwich or satisfy his sweet tooth. I would love to try your products and see the smile on his face again. I’ve recently found your site and have shared it to my Gluten-free friends. They’re loving it. Big Thanks! It’s great to have a reliable backup when time doesn’t permit for homemade baked goods. We will be trying some of these products soon, especially the grahms with summer s’mores just around the corner. We would love to try more of their products! I hope that they will reach our local stores in NC soon! My son would love to have graham crackers again! Schar products are a little hard to find in my area. I would love to try more of their products. I’m newly gluten free (like, as of a week ago) so I need to try it all! I’ve had their ciabatta, and was really tempted by those frozen baguettes in the grocery store last week…would love to try the grahams, though! I am so glad to know you like these products! They are in my Midwest stores, and I have tried the baguette and sandwich buns and crackers. Now I will be trying all of them. Thank you, and congratulations. Schaer products spoiled us when we lived in Germany, and I miss them! I have never tried their bread, but like the idea of some of the rolls being par-baked so you get more of a fresh baked taste instead of just defrosted. My daughter would love to try the honey grahams! I’m always on the lookout for good gluten-free foods, and I’ve never seen or heard of this brand! I’d love to try their products! I have only ever tried their vanilla sandwich cookies (sooo good with a cup of coffee), so would love to try some other products. I love to bake, but it is also so great to have go-to gluten free items that I can keep on hand, and Schar is great! I’d love to try more of their products. We love all the Schar products we’ve had so far, but have never tried most of these. It’s been so long (35+ years) since my DH has had a s’more he can’t remember what they tasted like, just that he liked them. It’d be great to surprise him with some! My celiac fiance and I are planning a campfire after the rehearsal dinner and have been looking for a way to do gluten-free s’mores – this would be so excellent (for then and, of course, for life generally)! Hi, I lost my first husband, 10 years after my 19 year old son died. My husband died of complications during surgery. He was a bad diabetic and a kidney transplant recipient. After 38 years together I was devastated. I am no happily remarried to a SUGAR, GLUTEN addict and he announce TODAY that he wants to try to break his addiction for the sake of his health. I would love, love, love to have him (and me, who needs to lose weight) try these products, to see if he can get healthy. Honestly, I can’t lose another loved one and these might be the answer, since his is really thin and has to replace those empty calories with some good foods, snacks, etc. Many thanks for your kind consideration. I would love to try the Schar products. I am still trying to cope with the gluten-free lifestyle and trying not to feel deprived in any way. Your cookbooks have helped more than words can convey….and good comfort food like wafers or cookies would send me over the moon. We got a box of Schar gluten free pizza crust in the discount section of my local store. My four year old can’t have gluten and this was by far her favorite pizza crust. Gluten free foods are so expensive. It’s like spinning the roulette wheel when you decide to plunk down $6.49 for a bag of fake Oreo type cookies. I would love to try their other products so my family can pick a winner. Come on Lady Luck! Oooh! We tried Schar cookies in Germany and loved them! If they’ve come to the U.S., I hope I can find them in Canada now, too . . .
Wow! What a great giveaway, would love to try some other Schar products, as my local store only has the crackers. Love the crackers, though! Those chocolate cookies sound deLIGHTful! This is great news. I found a box of the chocolate biscuits just yesterday for the first time in Columbia city, Seattle. I can now have proper tea with my British mum and won’t be left out with these awesome chocolate biscuits! I would love to try everything else they make too! I hope they start carrying these on Vashon. You make them sound so tasty! I would love to try making savory bread pudding and cookie pie crusts with Schar products! I was really excited when some of the schar bread products showed up here in Wyoming, the ciabatta rolls in particular were so much better then I was expecting! Would love it if more of their stuff became available where I live, I would love to try a new snack with my coffee! Love their breads; would love to try the cookies. Welcome to the new sponsor! These look wonderful! Thank you for the suggestion, I will definitely get these! My 10 year old daughter and I have been gluten free for three years now. I made the decision to try it along with her after reading Gluten Free Girl and am so happy I did. I’d love to try some new goodies with her. Thanks for doing such a great giveaway! I’m one month into a GF diet and my migraines have stopped! I miss being able to eat these items that Schars offers! Love this brand – hubby and I make yummy garlic bread with their baguettes every week for our GF spaghetti dinner and the kiddos love it! A few years ago, Schar’s bread was what inspired me to start trying to bake my own (again), because it showed me that delicious breads were actually possible GF! Last week we found out our 17 year old son has celiac disease. As an Italian family this is a hard transition since pasta and bread are a staple in our house. He also loves easy access foods but we have no idea what tastes good. Thank you for the chance to win Schar products. I’ve been gluten free over 10 years, but my husband has just realized it’s an issue for him as well. He’s really struggling with the “funny” bread and pasta I’m used to eating, some lemon cookies would go a long way toward easing his transition. We love Schar foods! They are delish. I was diagnosed with celiac 2 months ago…I would love to try anything that’s both gluten free and delicious! Graham crackers! I miss those, any idea if their products are available in Canada? I love Schar products. I was thrilled to find a panettone for Christmas this year too! They definitely help make this path to healing more fun and flavorful. Our twelve-year-old daughter has recently been diagnosed with gluten-intolerance. We want her to never feel left out or deprived because of this, so we are searching everywhere to find gluten-free recipes and products. We are looking forward to trying Schar products, hoping that she will find the same childhood joys–s’mores, French toast, brownies–that we were able to enjoy. Pkg food availability is behind the US, up here in Canada. I like to have it when traveling, there’s 4 of us eating GFCF in this house. The Honeygrams sound awesome!! I would literally die if I won! I live in a town in BC where gluten free products aren’t very accessible. Being a gluten free vegan is difficult as it is, so any yummy products would make a girl VERY happy! Oh my! This box would be a dream come true for my two celiacs, hubby and 5-year-old daughter, who is sadly denied the amount of sugar she truly deserves! We travel to Spain to see family every summer, and we live on Schar products from the local pharmacy/health food store. LOVE the dark chocolate shortbread! Wow, this would be a wonderful suprise to my newly diagnosed gluten-free 5 year old son. He was recently diagnosed with Alopecia; and transiting to gluten free has been a confusing and hard for him…..me too, if we are being honest! Even if we don’t win this giveway, it’s so wonderful to know there are great products that can provide him with some “treats”, and a sense of “normal” when he is amongst his peers. I have not found a good gluten free bread without the tummy-hurting xantham gum. I’d love to try their bread and have a go to again for sandwiches, etc.! Thank you for turning us on to the brand, we had their pasta last night and it was loved by the GF and non-GF members of our family. Can’t wait to try the graham crackers when we go camping this summer. I use Schar ladyfingers, but haven’t tried too many of their other products. I would love to try their bread. oh can’t wait to try the honey grahams. I’d love to try the graham crackers too! I am a s’more lover myself! The pasta has been delicious. \My daughter has just been diagnosed with Celiac Disease and I am learning to cook a whole new way. I am still trying to find brands of food that taste good. I would love to sample some of your products. I’ve loved the Schar bread I’ve tried and I’m excited to hear about more options! We’d love to try them and share them with our sweet nephews who are celiac/gluten-sensitive too. Dark chocolate shortbread…yum! I haven’t tried any Schar products yet although some are available where I live. Would love to try the par-baked breads, they look so good! would love to try these — finding gluten free products that actually taste good is an expensive challenge for our family! I have never tried their products so to win would be awesome!! I love Schar products, but there are never enough in my local grocery store! I’d love to try the graham crackers, those would be perfect for making things like pie crusts! I would LOVE to try some of these delicious-sounding products! I tend to do without breads & crackers as I don’t have much time to bake and many of the GF products I’ve tried are, well, disappointing. Thank you for this opportunity to try a new brand! I have recently found out that i am gluten intolerant and am searching for “normal” foods- our family LOVES going camping and I can’t even begin how heartbreaking it is just the thought of not having s’mores!!! I would love to be introduced to these products and not be so left out!! !